There are many types of communication between people. 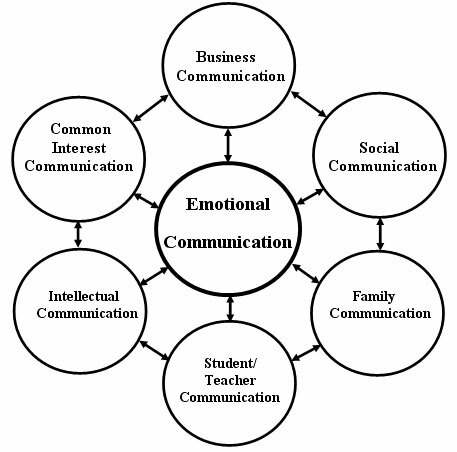 Some of the normal ones are: family communication, business communication, social communication, emotional communication and intellectual communication. Other types include common interest communication, common spiritual belief communication, student/teacher communication, and more. The most meaningful communication we have is emotional communication. Connecting with others on a deep level is important for a happy and healthy life. Emotional communication is truly food for the soul. Communication on an emotional level can be seen every day. Hugs, high-fives, pats on the back, shaking hands and broad smiles are some of the simple ways that we emotionally connect with one another. Then, there is a deeper layer of communication that we can create with others. These are special relationships that are internal, longstanding and strong. They can be with friends, family, coworkers or others who we share a special bond with. The strength of communication between two people is governed, in part, by personal needs. If a person is career focused he or she will have a more pressing need to create stronger business communication than someone who isn’t as concerned about advancing. Beyond personal needs, the length of time two people have known each other along with the amount of consideration each person consistently shows one another, leads to stronger communication. Everyone wants strong emotional connections however many people have a difficult time achieving them. You can build strong relationships, however they aren’t easy. Building strong relationships takes time, patience and sincerity. The rewards are a much more enriching and fulfilling life.